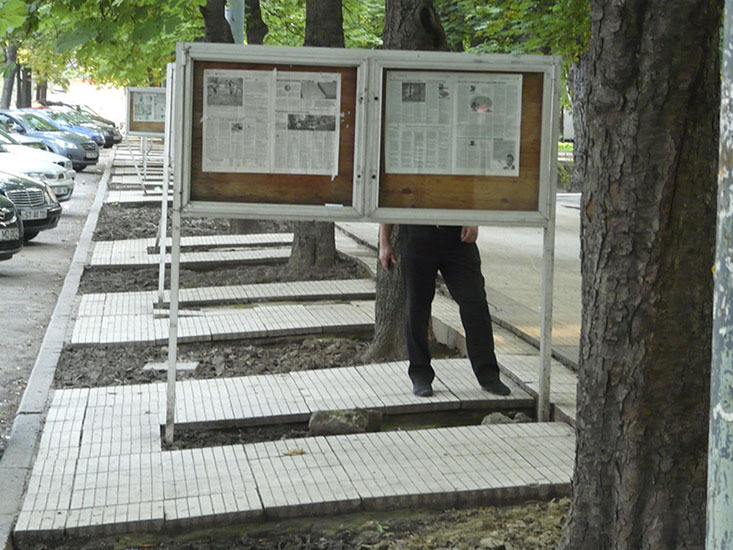 Jana Kapelová and Michal Moravčík (Public Pedestal) used format of newspaper as one of the other outcomes of their project “If You Don´t Need It?”. They documented a series of actions realized in part of the city Chisinau, in which is projected expansion of urban boulevard (exchange chairs, furniture redesign in the map shape of the affected area, metaphorical protection zone by drawing red lines on the furniture, stealing / disappearance of objects …) a significant change of this territory. Newspapers use inverted hierarchical structure (photo documentation), which is commented by stolen – exhausted language of contemporary public art (texts). The project returns back to the locality through the public showcase for newspapers reading. The “new” newspaper questioning to a random reading, If they do not need changes in Cantemir Boulevard. And also polemize with the art world as utopian platform for changes.